London Irish captain Luke Narraway said his side were "second best in every facet" of the 35-7 loss at Northampton. 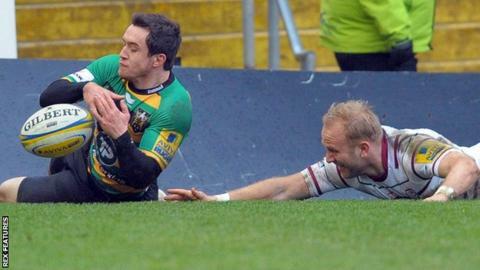 Saints ran in five tries at Franklin's Gardens to send Irish back to the foot of the Premiership and inflict their ninth defeat of the season. "I thought we started pretty brightly and then there was a massive momentum swing," Narraway told BBC Sport. "We're extremely disappointed, especially when we wanted to build on a win last week against Worcester." Irish sit two points adrift at the bottom of the table, after a win for Newcastle at home against Leicester and a losing bonus point for 11th-placed Worcester against Bath. "We thought we'd made real progress in our game after last week," added Narraway. "We wanted to come here and build something. We gave them too many scores and you can't give quality sides head starts." Irish face three tough games at home to Exeter and away at Leicester and Bath before travelling to New York next month to 'host' Saracens. "We need to bounce back," said Narraway. "Our form at home has been pretty good recently, we've got to dig ourselves out from where we are. "We're capable and it starts with home performances. They're the foundations that your league position is based on."